Governor Cuomo was joined today by Vice President Joe Biden to unveil the vision for the comprehensive redesign of LaGuardia Airport. The airport will be transformed into a single, structurally unified main terminal with expanded transportation access, significantly increased taxiway space and best-in-class passenger amenities. Construction on the first half of the new unified terminal, expected to be a $4 billion project that creates 8,000 direct jobs and 10,000 indirect jobs, will be managed by LaGuardia Gateway Partners, a new public private partnership chosen by the Port Authority of New York and New Jersey to build the project. Before: LaGuardia Airport will be transformed into a single, structurally unified main terminal with expanded transportation access, significantly increased taxiway space and best-in-class passenger amenities. After: Construction on the first half of the new unified terminal, expected to be a $4 billion project that creates 8,000 direct jobs and 10,000 indirect jobs, will be managed by LaGuardia Gateway Partners. Construction on the first half will begin upon final approval from the Board of Directors of the Port Authority of New York and New Jersey. That approval is expected in the first part of 2016; the majority of this first half of the project is expected to open to passengers in 2019, with full completion scheduled for approximately 18 months later. The second half of the new unified terminal is expected to be redeveloped by Delta Air Lines, which has indicated strong support for the new vision, and anticipates beginning the redevelopment of its terminals on a parallel track with the LaGuardia Gateway Partners project to complete the new unified airport. Video of a presentation that details the redesign, led by Dan Tishman, CEO of Tishman Construction Company and Chair of the Governor’s Airport Master Plan Advisory Panel, can be viewed here. The recommendation for a single, unified terminal is included in a sweeping LaGuardia redesign, developed by the Governor’s Airport Master Plan Advisory Panel, and released today. The report, which can be viewed here, presents the Panel’s recommendations, which will enable LaGuardia to meet the demands of the 21st century. SINGLE, UNIFIED TERMINAL – LaGuardia’s current terminal layout, comprised of multiple, fragmented terminals (photo here), will be replaced by one main, architecturally unified terminal. This will be accomplished by demolishing the existing Terminal B building, which is operated by the Port Authority, and replacing it with a larger structure, located closer to the Grand Central Parkway, which will include new terminal space and a new Central Arrivals and Departures Hall, and will link to Delta’s Terminals C and D. This represents the western half of the new structurally unified terminal. 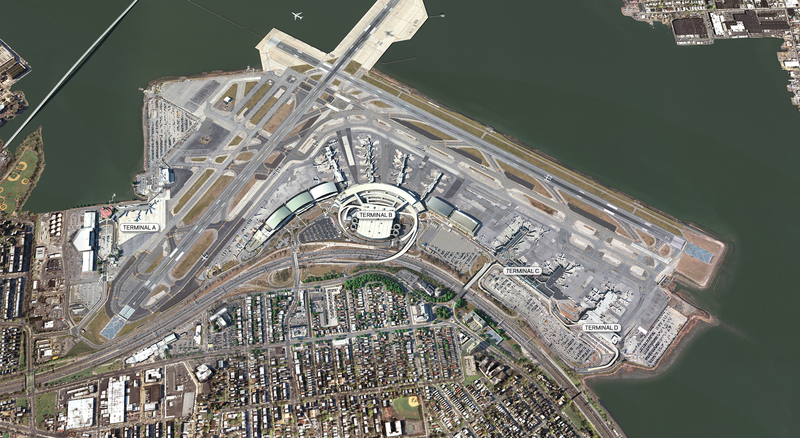 The eastern half of the new unified terminal will be constructed on a parallel track by Delta Air Lines redeveloping its existing Terminals closer to the Grand Central Parkway and connecting them to the new Central Arrivals and Departures Hall. Delta Air Lines is strongly supportive of this plan, and will move forward with the Panel’s recommendations in parallel with the construction schedule for the new space and Central Hall. TERMINAL LOCATION & ISLAND-GATES – To utilize LaGuardia's geographic footprint more efficiently, the new terminal facility will be built closer to the Grand Central Parkway. 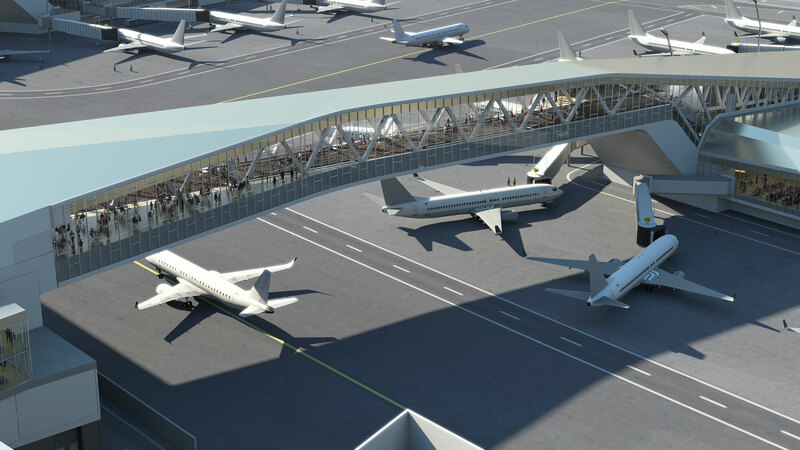 The redesigned facility will also utilize an island-gate system, in which passengers access their gates via raised pedestrian bridges, high enough for aircraft to taxi underneath, which connect back to the main terminal. A rendering of the island-gate system can be viewed here. Together, the relocated terminals and island-gate system will create nearly two miles of new taxiway space. This allows for a more efficient circulation of aircraft and reduced taxi-in and taxi-out times, which will yield shorter and fewer gate delays – a dramatic difference from today’s LaGuardia. In addition, this change will produce overall reduction in carbon emissions from idling aircraft. Vantage Airport Group – Currently manages nine airports across three continents, and has transitioned 19 airports from public to private management. Vantage, Skanska, and Meridiam – a global infrastructure investment fund. Will provide the committed equity investment. LGP would be responsible for designing, building, financing, operating, and maintaining the new terminal as part of a 35-year lease. In addition to the unified terminal structure, the Governor’s Advisory Panel made a number of other recommendations that will complement the new facility and bring LaGuardia into the 21st century. These recommendations are summarized below, and can be found in full in the Panel’s report. The Panel’s report incorporates elements from each of the top submissions to the Governor’s master plan design competition. Those three submissions were made by Dattner Architects, PRESENT Architecture and SHoP Architects. “We are extremely proud to have been able to contribute planning and design concepts which will transform LaGuardia Airport into a fully integrated multi-model development befitting New York City,” said Dattner Architects. “Governor Cuomo's initiative to transform LaGuardia Airport into a unique and accessible transportation hub is key for the future of the New York metropolitan area," said ​PRESENT Architecture. "Our firm is proud to be selected as a contributor to the architecture, master plan, and transportation vision to rethink and modernize New York City’s airports." "As Governor Cuomo has made clear, right now there is a once in a lifetime opportunity to implement a comprehensive design that will make LaGuardia Airport the truly world-class experience New Yorkers and visitors deserve," said SHoP Architects. "SHoP is proud that our ideas for an integrated terminal could contribute to solving that urgent need at this essential gateway to the city and the state." The Panel has also strongly recommended, with the support of the Port Authority, that a Master Planner be selected by RFP to be issued within 60 days by the Port Authority to help coordinate development of the remaining recommendations, under the oversight of a new committee of the Port Authority’s Board of Directors. A summary of those recommendations can be found below. EXPANDING TRANSPORTATION ACCESS – As part of his 2015 Opportunity Agenda, Governor Cuomo proposed creating an AirTrain option that directly connects LaGuardia to the New York City subway and Long Island Rail Road at Mets-Willets Point Station. The panel supports the Governor’s call for this AirTrain option, and the new LaGuardia’s unified terminal will be designed to incorporate a future AirTrain terminal. The Panel recommends that the airport once again be made accessible by ferry service. The panel also calls for an enhanced road configuration to improve passenger access and reduce traffic on local streets in the airport’s vicinity, including the Grand Central Parkway. The interior of the new unified terminal will also be intuitive for passengers to easily navigate, and will facilitate efficient movement throughout the airport. A transit option to move passengers more quickly within the airport is recommended by the Panel, such as a tram or monorail, to be included as construction moves forward. This transit option would also better integrate the Marine Air Terminal (Terminal A) with the rest of the airport housed in the new unified terminal. IMPROVING PASSENGER EXPERIENCE – Taking into account the realities of post-9/11 air travel, the Panel recommends that the new unified facility contain additional space for security check-in, which will help diminish wait times for passengers as they pass through mandatory TSA screening. The facility – both in its individual terminals and the central hall – will also be built with significant height and openness in order to allow for a superior passenger experience, clearer signage, greater use of natural light and overall aesthetic improvements. The central hall will also be designed with space for best-in-class passenger amenities in retail, dining, and business and conference center capabilities, as well as the option to include a 200-room boutique hotel option convenient for travelers. INCREASING STORM RESILIENCY – During Superstorm Sandy, approximately 100 million gallons of saltwater flooded the airport and shut it down for two days, impacting 250,000 passengers and causing an estimated economic loss to the region of roughly $108 million. With this in mind, the Panel recommends elevating critical infrastructure in order to keep the airport operational during a flood event and better prepare the airport for similar extreme weather events. SUPPORTING SURROUNDING COMMUNITIES – The redesign of LaGuardia is vital to transforming the airport into a 21st century facility and maintaining economic competitiveness throughout the region – but it is also important for the airport to be a good neighbor to its surrounding communities. Currently, the neighborhoods in the immediate vicinity of LaGuardia experience significant automobile traffic on local roads and the Grand Central Parkway from passengers either parking outside of the airport’s ground or from motorists waiting to pick up passengers from the airport as they arrive. Under the new design plan, the Panel recommends increasing parking options on-site and identifying a location for a cell phone waiting area in order to reduce congestion on local streets. Additionally, the Panel also recommends a new rental car facility be created to concentrate the ten car rental companies that currently serve LaGuardia from multiple dispersed locations, further reducing congestion. The Panel has recommended that the Port Authority will ensure that the project’s employment reflects a broad spectrum of the communities in the region, and should recognize Governor Cuomo’s goal of 30 percent MWBE participation. It will also build on the Port Authority’s longstanding commitment to supporting Airport Concession Disadvantaged Business Enterprises (ADCBE). Senator Charles E. Schumer said, “LaGuardia is one of New York’s greatest assets, and it’s time that we make the big investments needed to bring it up to speed for the 21st century. By redesigning the airport from top to bottom, this plan gives New Yorkers the facilities that our city and our state deserve. I’m glad Governor Cuomo and the Port Authority are stepping up on this huge infrastructure project, and look forward to seeing it move aheadý." New York City Mayor Bill de Blasio said, "Bringing LaGuardia Airport into the 21st century is critical to keeping New York City competitive. This is a gateway to New York City and the region for millions of tourists and businesses. I applaud Governor Cuomo and Vice President Biden for undertaking a revitalization of LaGuardia that promises to drive growth across the region and dramatically improve service for passengers." New York State AFL-CIO President Mario Cilento said, "LaGuardia Airport is crucial to the region's economy. We commend the Governor for making the redesign possible. This is a huge construction project that will create good, prevailing wage jobs with benefits for all airport workers, and our union brothers and sisters. It will help grow the middle class both in New York City and in the surrounding communities. This is exactly the type of shot-in-the-arm we need for working families and our economy as a whole." In addition to the redesign plan for LaGuardia Airport, Governor Cuomo also provided an update on the status of efforts to revolutionize and modernize JFK, Republic and Stewart Airports. JFK International Airport – JFK is one of the few international airports without an on-airport hotel. Governor Cuomo announced today the construction of a new state-of-the-art hotel at JFK in the historic TWA Flight Center, which was designed by world-renowned architect Eero Saarinen. The hotel will include 505 guestrooms, 40,000 square feet of conference, event, and meeting space, and a 10,000 square foot observation deck. The hotel will also be LEED certified. The redevelopment of JFK’s TWA Flight Center Hotel will move forward under a public-private partnership between MCR Development, JetBlue and the Port Authority of New York and New Jersey. The $265 million construction project, which is expected to break ground next year, will generate 3,700 jobs, and is expected to open in 2018. "We are thrilled the TWA Flight Center will come alive again," said Rich Smyth, Vice President of Corporate Real Estate, JetBlue. "Saarinen’s aviation icon sits at the front door of our flagship T5 terminal, offering exciting collaboration opportunities that will benefit our customers and crewmembers. As New York’s Hometown Airline, we are proud to be a minority investor in MCR's plan, which celebrates the landmark’s rich history while returning it to public use. We want to thank Governor Cuomo for his leadership in supporting our long-held belief that the TWA terminal can viably be restored and re-opened." The Governor also announced today plans to move forward to develop a full master plan for future development at JFK airport. The Governor has directed the Advisory Panel to report back in the next twelve months with its recommendations for an implementable master plan for the development of a 21st century JKF International Airport. Within the next 60 days, the Panel will work with the Port Authority to issue an RFP to retain a master planning firm to advise the Governor, the Panel, and the Port Authority on the future development of the airport. New RFIs for Republic & Stewart – Empire State Development has issued new RFIs with a primary focus on enhancing the regional economic activity at both Republic and Stewart International airports. Specific sites have been identified for future development, and ESD will guide the development of these sites via a new real estate broker: Newmark Knight Grubb Frank.